Caskets vs Coffins- Is there a Difference? The terms casket and coffin are often used interchangeably, but do they mean the same thing? While both the coffin and the casket are used for the same purpose, the two actually differ in terms of their design, materials and history. The history of the coffin is a fairly long one, the term has been used from as early as the 16th century, but the concept of the coffin far precedes that. Humans have been burying their dead for over 100,000 years, and the use of coffin-like structures can be traced to the Celts and Ancient Egyptians who used hand-crafted burial boxes from wood and stone, and the widely-known sarcophagus, respectively. The word ‘coffin’ is derived from the Greek word ‘kophinos’ meaning ‘basket,’ and is used to describe a box or container which holds a deceased person for a funeral service and burial. On the other hand, the word ‘casket’ is considered to be a more modern expression compared to its counterpart. Originally, the term was used to describe a box used to store jewellery and other small valuables, he words only evolved to hold an additional meaning synonymous with the word ‘coffin’ around the mid-19th century. The main difference between the coffin and casket can be seen in their design differences, particularly their shape. A coffin has six sides with a lid and base, its shape is typically wider at the top section of the box and narrower at its bottom-end. The coffin is usually associated with those seen in classic movies, particularly in classic western and gothic films. A casket, however, is rectangular in shape with four sides, a lid and a base, and is more widely associated with its contemporary use in North America. While you may never need to know the difference between a coffin and casket, to many, choosing a coffin or casket for a loved one is a personal decision made to pay tribute to a life well lived. For this reason, understanding the stylistic features, characteristics and origins of both the coffin and casket can prove significant in guiding one to accurately honour their loved one in the way they wish to. – The word ‘casket’ was thought to be adopted as a euphemism for the word ‘coffin’ as it was considered less morbid, with a lessened connotation to death. Furthermore, the shape of a casket was considered less dismal as, unlike its counterpart, it did not portray the silhouette of a dead body. This may contribute to the reason why the two terms often get confused with one another. 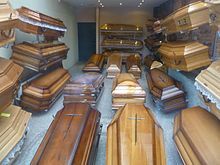 – The mass production of coffins began during the Civil War as there was such a high demand in coffins to transport the deceased, from this, during the late 19th Century, the casket industry arose. – The initial reason as to why coffins were built to be narrow at their bottom was to save money on wood by merely accommodating to the silhouette of a person; a wider shoulder width and a narrow width of the feet. – Ever wondered why we’re buried ‘6 feet under?’: After a period of trial and error, it was proved that being buried 6 feet deep was the ideal depth to prevent the spread of infectious disease and animals from digging up a grave to reach a deceased. Today, graves are usually dug around 4 ½ feet deep, however coffins and caskets are much heavier, stronger, and better-sealed compared to what they used to be. – Reusable coffins used to be a thing: In the late 1700s, the need to save wood was great enough that reusable coffins became the new fad. At the bottom of each coffin, trap doors were installed so when the time came, those performing the burial ceremony could flip the switch to release the deceased into the grave, and the coffin was returned to be used again. This craze however was short-lived, as after around six months, the public began questioning the intent behind the trend and demanded it to be stopped. – Premature burial led to the introduction and widespread use of safety coffins: Throughout the 18th and 19th century, particularly during the peak of the cholera epidemic, premature burial was a very real and common issue that terrorized the public. On top of this, Edgar Allen Poe’s story “The Premature Burial” didn’t help matters. To deal with this issue, a series of safety coffins were created which were installed with a bell to alert cemetery guards around them, and a small hatch to allow fresh air to enter while waiting to be released. The first recorded safety coffin was constructed for Duke Ferdinand of Brunswick upon his orders before his death in 1792, he even had the coffin fitted with a lock as opposed to being nailed shut and ordered for the lock keys to be kept in his suit pocket for burial.